On this page details of all forthcoming events will be posted. Keep checking back as we are always adding new events! Conservation volunteer day, Portway Hill, Friday 3rd May 2019, 10:00am – 3:00pm. Join the Wildlife Trust for Birmingham & the Black Country at Portway Hill for a fun day out meeting new people, helping the environment and learning new skills. Meet on St Brades Close; ensure you are dressed appropriately for the forecast weather conditions, and wear sturdy footwear. You will need to bring along a packed lunch but tea, coffee and biscuits will be provided. No need to book, just turn up! Dawn chorus walk, Portway Hill, Monday 6th May 2019, 7:00am. Join local bird expert Nick Horton for a dawn chorus walk around the Portway Hill site. In December Nick spotted a Red Kite on two separate occasions over Turners/Portway Hill and watched crows mobbing a Raven. We will also be on the lookout for Whitethroat, Lesser Whitethroat, Peregrine, Buzzard, Sparrowhawk and Kestrel, all birds regularly seen on the hillside. Wear sturdy footwear and dress appropriately for the early morning weather conditions. Meet on St Brades Close at the junction with Tower Road. Green Hairstreak search, Portway Hill, Saturday 25th May, 11:00am. Meet just inside the entrance to Bury Hill Park, which is a short distance to the north of Cookhouse and Pub, on A4123 Wolverhampton Road. Conservation volunteer days are run by the Wildlife Trust for Birmingham & the Black Country; for further information please contact The Wildlife Trust, telephone 0121 523 0094 or email TomH@bbcwildlife.org.uk. 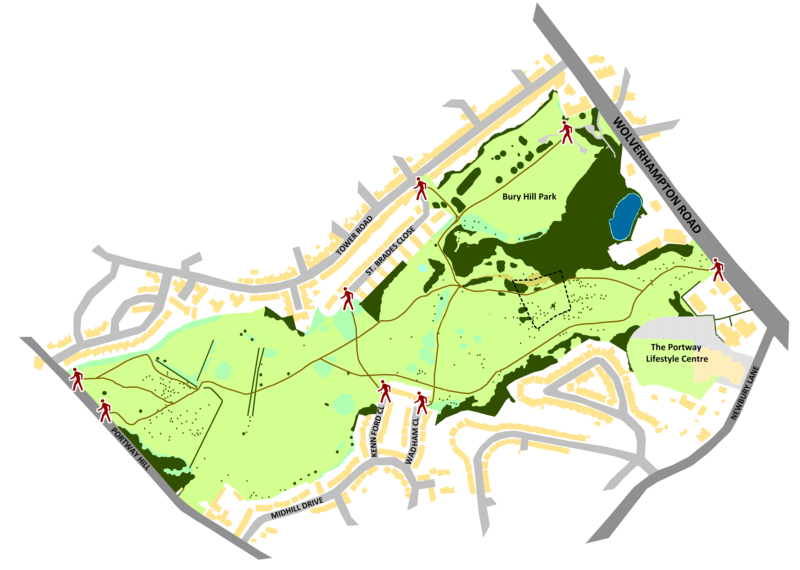 Their Portway Hill reserve is located within the dotted black square on the map below. Great to see this information – it is very helpful and I have noted my diary to prompt me to participate whenever I am available! Many thanks to everyone who gives their time and energy to provide us with details of all the events that are taking place on the Rowley Hills. What a wonderful place we have on our doorstep – very therapeutic and you will meet lovely people who are making a difference to our neighbourhood and confirm “the best things in life definitely are free” and available to all. New faces and all ages are very welcome – be active and healthier on the hillside!